If a baby does not pass the newborn hearing screening at the hospital or birthing site, it is very important to return for a follow-up hearing screening. Not passing the hearing screening does not mean your baby has a hearing loss, but follow-up screening is a step closer to identifying if a baby has a hearing loss. Some babies are born with certain high risk factors for developing a hearing loss. Your baby may pass the hearing screening before discharge from the hospital or birthing site, but if your baby was born with high risk factors, it is important for your baby to get a diagnostic audiological evaluation (DAE) by 6 months of age or sooner, if recommended by your doctor. Newborn hearing screening is conducted using a special equipment called Otoacoustic Emissions (OAE). A sensitive microphone is placed in baby’s ear canal while baby is sleeping or very quiet. The equipment records the ear’s response to sounds. This procedure is quick,easy, and does not hurt the baby. No further testing is needed if the baby passes the OAE hearing screen. If baby does not pass the OAE Screening, An Automated Auditory Brainstem Response (AABR) Screening Equipment is used. Sensors are placed on the baby’s forehead, back of the neck, and shoulder. Earcups are used to deliver sounds to the baby’s ears. The AABR device records the brain’s response to sound. No further testing is needed if the baby passes the AABR hearing screen. 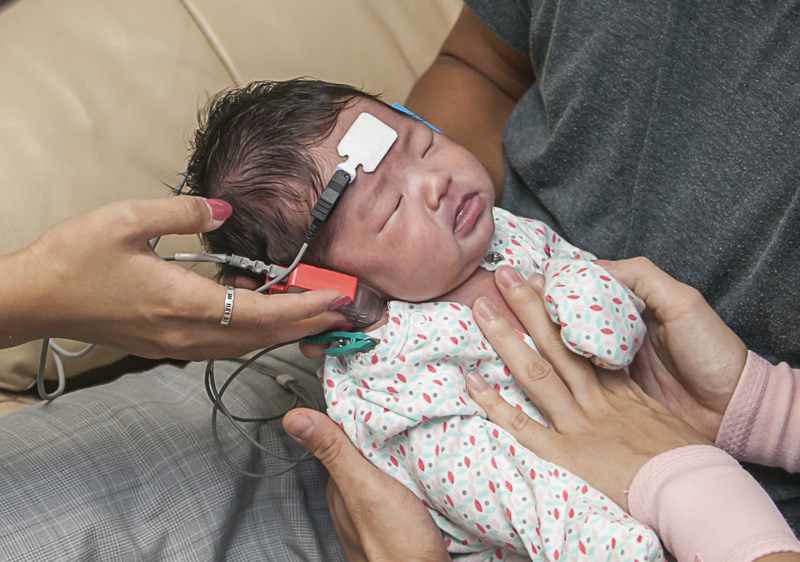 If a baby does not pass the AABR, the child will receive a referral to Guam Early Intervention System, and is given an outpatient hearing re-screen appointment. It is important that your child is seen in a timely manner to determine if more testing is necessary. Newborn hearing screening is a procedure conducted before an infant is discharged from the hospital or birthing center. This is a standard of care for all babies born on Guam. Newborn hearing screening identifies if a baby might have a hearing loss. Some babies are born with certain high risk factors for developing a hearing loss. Your baby may pass the hearing screening before discharge from the hospital or birthing site, but if your baby was born with high risk factors, it is important to bring him back for a follow-up testing by 6 months of age. Occurs when sound is not conducted efficiently through the outer ear canal to the eardrum and the tiny bones, or ossicles, of the middle ear. It usually involves a reduction in sound level, or the ability to hear faint sounds. This type of hearing loss can often be medically or surgically corrected. Occurs when there is damage to the inner ear (cochlea) or to the nerve pathways from the inner ear (retrocochlear) to the brain. It cannot be medically or surgically corrected and is a permanent loss. This type of loss not only involves a reduction in sound level, or the ability to hear faint sounds, but it also affects the ability to hear clearly and understand speech. Sometimes a conductive hearing loss occurs in combination with a sensorineural hearing loss. 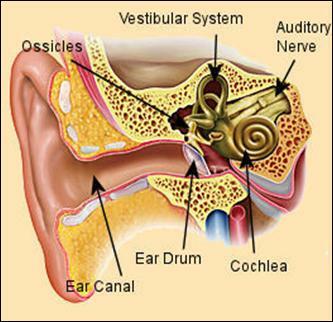 This means that there may be damage in the outer or middle ear and in the inner ear (cochlea) or auditory nerve. Early intervention services are family-centered services and supports that help families meet the overall developmental needs of an infant or toddler (birth to three years old). The Guam Department of Education Guam Early Intervention System (GEIS) provides diagnostic, family support, and intervention services to infants, toddlers, and their families. Information is gathered about the child, and parents’ consent is obtained. Evaluation / Assessment is conducted to determine if the child is eligible for services. The family is involved with the evaluation process. The evaluation(s) will be reviewed and eligibility for the program will be determined with the family. For more information about the Guam Early Intervention System please call 300-5776 / 5816, or visit their website at sites.google.com/a/gdoe.net/geis/. What is a developmental milestone? Developmental milestones are a set of functional skills or age-specific tasks that most children can do at a certain age range. Your pediatrician or primary health care provider uses milestones to help check how your child is developing. Every child is unique. Therefore, although each milestone has an age level, when a developmental milestone is achieved varies from child to child. Download CDC’s Free Milestone Tracker App from the Apple App Store, and Google Play. Learn more at cdc.gov/MilestoneTracker. The Guam EHDI Family Support Group is made up of parents with children ages 2-10 who are deaf or hard of hearing and their families. The Group has been meeting since 2004 and has been sharing joys and tribulations of the challenges they face. Babies learn to talk and communicate through hearing sounds and words from you and those around him/her. If your baby has a hearing loss, it may interfere with his/her ability to speak and communicate. Hearing screening allows you to know if your baby has a hearing loss so you can get the appropriate intervention services as soon as possible. Is there a fee for newborn hearing screening? No. 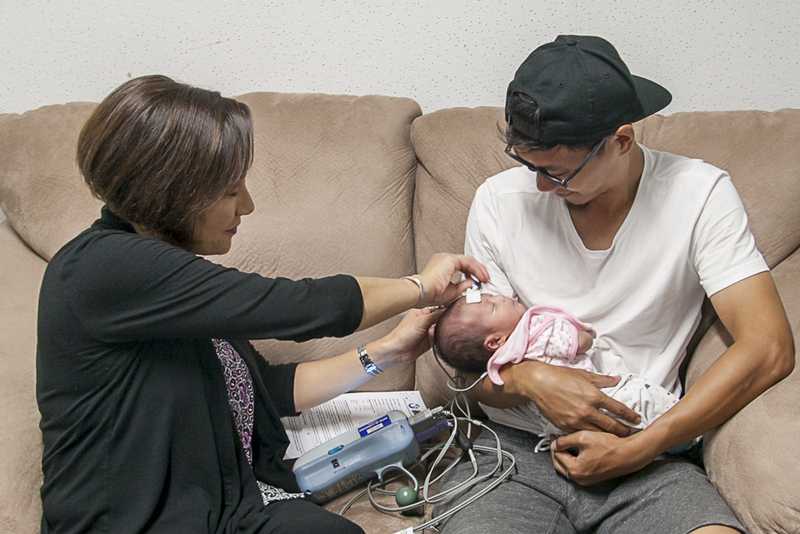 The law mandates newborn hearing screening as a standard of care for ALL newborns on Guam. The screening is part of the routine care given to babies at birth, just like taking their weight and temperature. What if my baby fails the hearing screening? If your baby fails the hearing screening, it does not mean he or she is deaf or has a hearing loss. It just means your baby needs further testing. Your baby will be referred to the Guam Early Intervention System (GEIS) for further hearing evaluation. It is important to keep your baby’s hearing evaluation appointment to find out if your baby has hearing loss. Some babies need to be tested again even if they pass the first screening. Some babies may have certain risk factors that may cause a hearing loss, as they grow older. These babies need to have a hearing evaluation at 6 months of age, so discuss this with your baby’s doctor for a referral to an audiologist. What are the risk factors that might cause my baby to have a hearing loss?